London casts a long shadow over the architecture of the UK. In this year’s crop of 56 national and EU RIBA Awards, for instance, few practices do not have a London base, and of those from England only one. That is is Winchester-based Design Engine, and the building in question is at Oxford Brookes University. Which just happens to be on the London Road. The £83m project, at the Headington campus of the university to the east of the city, fully deserves its national accolade and proves that the capital might call most of the shots when it comes to the big, high-profile projects – but not all of them. Indeed, it made it to the RIBA’s 15-strong ‘midlist’ for the Stirling Prize in what is a strong year, and therefore is officially one of the top 15 buildings in the UK (and by Brits in the EU). Possibly its slightly disappointing exterior halted its progress further, because otherwise this is a strikingly successful building. This is a very bold move by Brookes (as it is generally known). It gives this former polytechnic – academically one of the most successful of the early 1990s wave of new universities – a gateway presence as well as a varied chunk of new facilities, from library through lecture rooms to student union, cafés and restaurants. That is a lot of programme and its great achievement is the way it brings all these aspects together, playing the various elements off against each other to generate an exceptionally rich and satisfying interior. At concept stage the architect reduced all this to a simple block model: a central, glowing box interpenetrated by ‘pegs’ of accommodation reaching out to the wider campus. One of these ‘pegs’ consists of the earlier thorough refurbishment and extension of the 1950s Abercrombie wing of the university (RIBA Journal, November 2012). Although it will be filed under ‘higher education’, take a look at how this complex works and you realise that it qualifies as a mixed-use development that’s essentially a civic centre. Consider: there is a grand entrance plaza in the form of a gently sloping ramp, taking you up from the aforesaid London Road to the entrance. A Corten-clad colonnade of shops on your left takes you there under shelter if needed – and sets up one of the leitmotifs of the building as this band of Corten snakes its ribbon-like way right through the complex. The feel inside – the library, the cafes, the expressed wedge of the auditorium, the view down through to a green courtyard beyond, the teaching and meeting rooms – is very like the current generation of civic centres with their combination of outward and inward facing elements. The ramp has a twofold function. Its rise means that you arrive at first floor level, which shortens journey distances, makes security easier for the bustling atrium floor below, and generally energises your view of the building. That in turn makes a void beneath the ramp that is used as the labyrinthine cool-air intake for the lecture theatre that hangs so dramatically within the building. This is part of a sustainability policy that includes exposed thermal-mass structure – both precast and insitu – and careful orientation and variation to the solid/void ratio of the facades (overall 42% glazed). There are green and brown roofs, a 600 m2 array of photovoltaics, a combined heating and cooling plant, rainwater harvesting and a Sustainable Urban Drainage System (SUDS) which means that there is no increase in run-off as a result of this densification of building on the site. Specification was done with reference to the BRE Green Guide. All this adds up to a BREEAM ‘Excellent’ rated building. Not, I would imagine, that the students or staff will necessarily notice much of this because this is not a building that wears a hair shirt. On the contrary, it seems opulent in the best sense, which is the generous organisation of space. The ‘wow’ moment is when you enter the building and look down into the lower area known as the ‘Forum’ while above you is the concertina-like form of the lecture theatre, and facing you is the end of the library. This is where all the ‘pegs’ come together and it all helps to generate a very dynamic space in which the enormous volume – 20.6m from floor to roof, a few inches higher than the nave of Wells Cathedral – is put to good use. There is, for instance, a sitting-out space on top of the lecture theatre, accessed via a bridge from the library. Diagonal views from level to level within and through the building were paying off when I visited in graduation week – when the whole place was swarming with gowned, mortar-boarded students and their families. The forum with its café was bustling, people were spilling out into the relandscaped courtyard or the seating of the entrance ramp, and of course a million selfies were being taken. Never underestimate the importance of space and drama to the student experience: although necessarily much more tightly planned, O’Donnell + Tuomey’s Saw Swee Hock student centre at London’s LSE performs the same function. Away from this you get a run of standard student teaching rooms and fairly unremarkable student union quarters (though landscaping of a further courtyard in the masterplan will transform these) but there is an emphatic end-stop to the composition: the refectory in its glazed Corten pavilion, raised to give views over the adjacent playing fields. It may only be a cafeteria, but in quality of space and finish it wouldn’t disgrace a college in the other Oxford. I mentioned the facades. 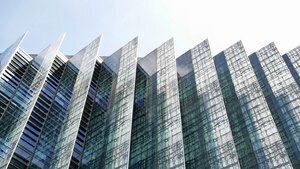 Of unitised construction, these tend towards the bland – although crisply detailed, the main approach facade has something of the business park about it, for instance. Where it gets interesting is where it has been broken down, the box eroded – on the western flank where a lot of planning negotiations with demanding residential neighbours took place. A vertical sawtooth arrangement for the library allows daylight in without overlooking the locals. The fritting on the glazed fins, taking its pattern from plant-science cell structure, helps to make a busy and curiously satisfying promenade along what is pretty much the back of the building. 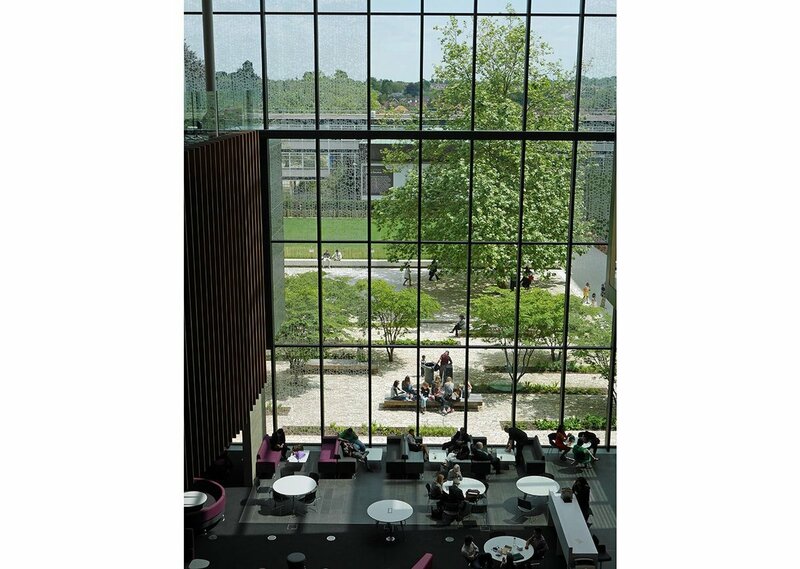 The John Henry Brookes building reflects well on both client and architect. It is a place of learning, administration and relaxation that works at various speeds and various levels of privacy from the ultra-public to the ultra-concentrated. It gives the institution a focus and a sense of physical stature that it previously lacked. Not quite Stirling-shortlistable, given the competition this year? Never mind: if there’s any justice this should bring Design Engine to the attention of quite a few academic and civic institutions around Europe.